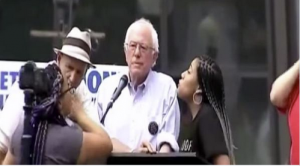 Democratic presidential candidate and Sen. Bernie Sanders (I-VT) was forced off the stage at a campaign event in Seattle on Saturday when organizers with the Black Lives Matter movement took over the microphone. Sanders thanked Seattle for being “one of the most progressive cities in the United States of America” before the protestors stormed the stage. Marissa Janae Johnson and Mara Jacqeline Willaford, co-founders of Seattle’s Black Lives Matter chapter, demanded a turn at the mic, which an event organizer agreed to give them. “Now that you’ve covered yourself in your white supremacist liberalism, I will formally welcome Bernie Sanders to Seattle,” Johnson told the crowd, according to CNN. Sanders left the event after the protestors reportedly spoke for about 20 minutes, according to a CBS report.